Ullmark is Playing for the Cup; CJ Smith Ends his Slump · Let's Go Amerks! 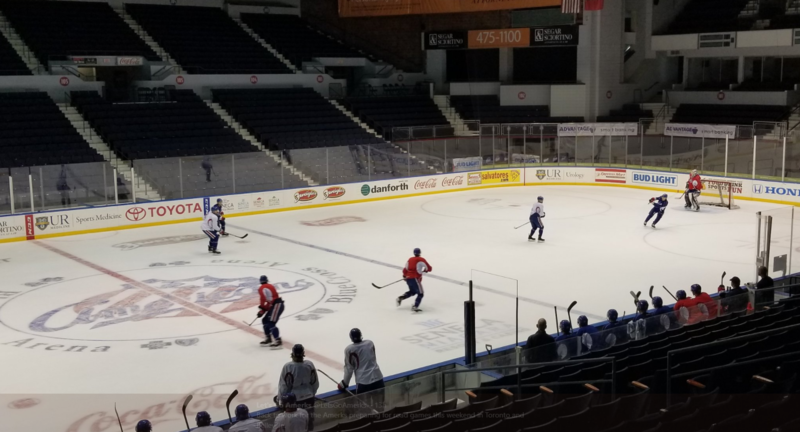 After a great weekend in Charlotte the Amerks returned home to practice for road games ahead vs Toronto and Belleville before the All-Star break. They had won 4-1 and then were down 4-1 and scored three goals before losing in overtime. Linus Ullmark is always great for his positive attitude, outlook on life and moving forward. He’s also looking towards spring hockey for the first time in North America. He’s played in 30 games for the Amerks this season and is tied for second in the AHL with 17 wins. He’ll also be headed to the AHL All-Star Game in Utica this coming weekend. As the wins start adding up he still knows how important it is to have unwind and keep life balanced. Mr and Mrs Ullmark have March 20th circled on their calendar as the due date for their first child. Talking about that Linus had the new dad smile on his face with the excitement of what’s to come and he also joked about how he’ll need to be well rested. He’s played in the NHL, he’s an AHL All-Star, he’s leading the Amerks so what else does he have to accomplish? A playoff run. CJ Smith went through his first slump as a pro at the end of December going seven games without a point. In the last eight games he’s had 4G+3A. Defenseman Matt Tennyson was called up to the Sabres due to an injury to Nathan Beaulieu on Monday night. Beaulieu was hit early in the game on Monday and left with an apparent concussion and has since been placed on injured reserve. Brendan Guhle was missing from Amerks practice on Tuesday morning. No update on his absence. He had left practice early last Tuesday and missed a game on Sunday in Charlotte. With two defenseman out of the lineup the Amerks have called up Arvin Atwal from the Cincinnati Cyclones. No new updates on MacWilliam (week to week / upper body), Blackwell (week to week / upper body) or Goers (indefinite).